Maureen writes about what she knows and what she loves: newspapers and Maine. As a third generation newspaper editor, she portrays her protagonist, Bernie O'Dea, with a realism that can't be matched. She also paints Maine with a strong and loving brush. The reader can almost smell the decaying leaves on the ground and feel the sweltering humidity of the Maine summer. With masterful use of flashbacks and step backs, Milliken braids three time lines into a single strong story that grabs the reader's attention and doesn't let it go. Bernie as owner of the local weekly newspaper, and Pete Novotny, the Chief of Police, can't avoid each other. It's part of their jobs to interact. It makes some awkward moments as Bernie can't always remember where the relationship is at any given moment. It's hard enough getting through life with adult ADHD without complicating things with remembering if they're friends, more than friends, of if Pete's mad at her and would rather not answer questions—even those about the bizarre murder. Speaking of murder, where's the rest of the body anyway? 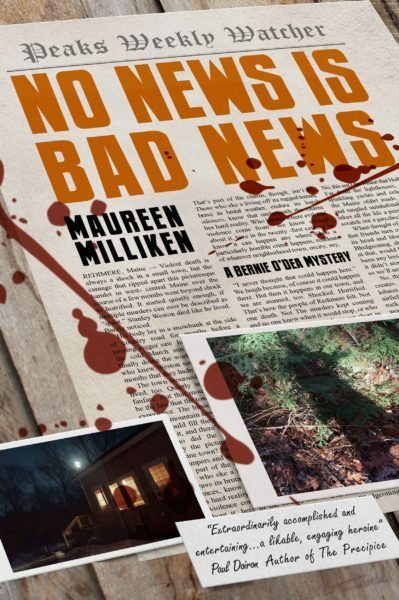 No News is Bad News by Maureen Milliken is available from S&H Publishing.